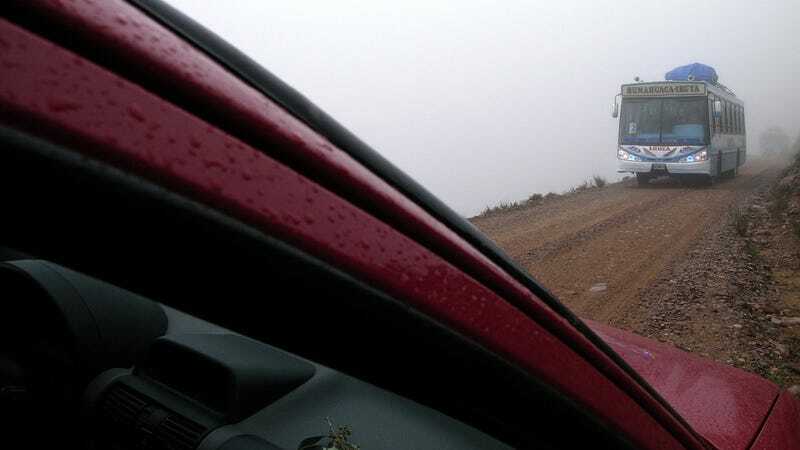 No road trip in the Andes is complete without encountering a terrifying mountain road. Bolivia’s North Yungas Road, known from Top Gear and the adventure tales of your backpacker friends who’ve ridden bikes down its suicidal curves, is probably the most famous. If you don’t want to drop dead either of a heart attack or, literally, of a 2,000-foot drop, Argentina offers a gentler alternative. The road from Humahuaca to Iruya is gorgeous, long, terrifying and it won’t kill you. Well, maybe it won’t. Guarantees don’t come set in stone a third of the way between sea level and the cruising height of commercial jetliners, which is where the 30-mile dirt road, which branches off the highway to Bolivia to reach the mountain village of Iruya, tops out. Summertime up there is ferocious winds inside a cloud, 40-ish temperatures and instant sunburns. Pick two. Winters are, well, worse. It’s beautiful, forlorn, high desert country, the southern edge of the altiplano, which connects Peru, Bolivia, Chile and Argentina in a great plateau of oxygen-starved mountain love. You can get here by following Ruta Nacional 9 north, towards the Bolivian border. The road dates back to the days of the Viceroyalty of Peru, when it connected Lima with Buenos Aires across the altiplano. After passing Jujuy, the last major city, it climbs steeply to around 9,000 feet and continues up the Quebrada de Humahuaca, which is a crazy, rainbow-colored desert canyon similar to the acid trip highway of the Quebrada de Cafayate, to the southwest. It becomes drier and more desolate the further north you drive. Entertainment is provided by the church in the village of Uquía, where the archangels are depicted wearing flamingo feathers and pink leggings, armed with Spanish muskets, proof that the signal to noise ratio of Catholicism before the age of rapid communication was a losing battle against local influences. This is where the road to Iruya begins. It’s mostly used by locals and buses but it’s entirely possible to tackle it in a small rent-a-car. You won’t be going very fast, leaving plenty of time to admire the dramatic, inhuman scenery of colored rocks, crafty cactuses and high-altitude cows. Scariness comes gradually. First, it’s an empty dirt road. Drops appear. Then you drive into the clouds. The drops increase. You cross from Jujuy province to Salta province, where Iruya is. This is where the road tops out, at 13,000 feet above sea level. The drops increase further. There are, of course, no guardrails. Because you’re inside a cloud, everything is slippery. It helps to be comfortable with first gear and second gear. It is perhaps time to mention the buses. The buses come from Humahuaca, the last major town before the Bolivian border. They’re big. Sometimes, they come in pairs. It doesn’t look like there’s enough space for both a bus and your car but there is. If you think of space in the Neapolitan way, that is. The clouds are your friends. They obscure the sickening drops. Inside the car, hugging the rock wall, it’s easy to feel sympathy for the bus’s passengers, whose view from the top seats is nothing but a cloudy blankness of unimaginable depth. Iruya, while set in a beautiful pink valley with the obligatory condors circling overhead, is actually a pretty depressing place, so it’s best to turn around and head back to Ruta Nacional 9 if there’s enough daylight left. Back on the road, you will feel awesome. You will feel elated. You will feel immortal. You will also be on an empty road with nowhere to sleep but that’s okay. Argentina is a wonderful place. It’s winter now, the nights are dead cold on the altiplano, and I think of its delicious mountain cows and its lovely, generous people. But most of all, I think of its endless, empty lands and its endless, empty roads, the most magnificent driving roads I have ever seen.